Despite their diminutive size, raptors were among the most terrifying dinosaurs to menace the Cretaceous Period. But as the discovery of a new dinosaur called Murusraptor shows, their plus-sized versions, aptly known as “megaraptors,” were considerably worse. This is a super-cool specimen from a very enigmatic family of big dinosaurs. 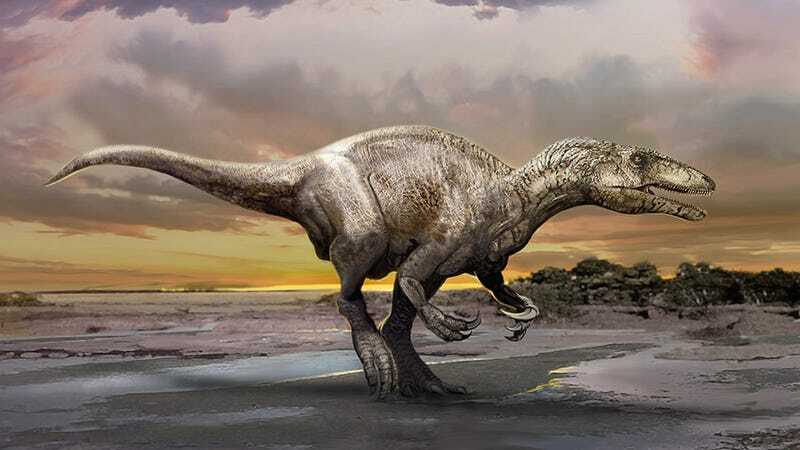 The fossilized remains of this dinosaur, now known as Murusraptor barrosaensis, was discovered back in 2000 at the Sierra Barrosa site in Argentina, but it has taken University of Alberta paleontologist Philip Currie and his team over a decade to perform their analysis. In a paper published in PLOS ONE, the researchers describe the skeleton as one of the most complete megaraptors ever found, and it’s offering fresh clues to the origin of this mysterious new family of dinosaurs. “This is a super-cool specimen from a very enigmatic family of big dinosaurs,” noted Currie in a statement. “Because we have most of the skeleton in a single entity, it really helps consolidate their relationships to other animals.” By other animals, Currie is referring to Murusraptor’s fellow megaraptor cousins, megaraptor namunhaiquii, orkoraptor, and aerosteon. Precious little evidence of this dinosaur family exists in the fossil record, but scientists have managed to find traces of their existence in Japan, Brazil, Patagonia, and Australia. These fearsome, mid-sized theropods featured large claws and air-filled bird-like bones. They lived during the Cretaceous Period some 84 million years ago, but their evolutionary origins aren’t entirely clear. Some scientists think they’re derived from coelurosaurs, a subgroup of dinosaurs that include Tyrannosaurs, while others believe they’re derived from neovenatorids, a family of dinosaurs in the Allosaurus family. Though technically a “medium-sized” dinosaur, Murusraptor was not a creature to be trifled with. The specimen analyzed by Currie was a juvenile that measured over 26 feet long (8 meters) when it was alive—and it was still growing. It featured an enormous set of claws that it likely used to seize and shred apart its prey. Like other megaraptors, its hips were pneumatic, meaning they were filled with air. This meant that—like modern birds—Murusraptor’s bones were light, allowing for exceptional speed and agility, even for a creature of that size. With its low center of gravity, this carnivore was clearly designed to hunt. Importantly, the fossilized remains of Murusraptor contained an unusually intact braincase and distinctive features not previously seen in other megaraptors. “It’s the only known braincase material we have of any megaraptor,” said Currie. He believes that the discovery of this skeleton will help paleontologists finally discern the true evolutionary origins the megaraptor family.